LIONEL #6-12975 "STEINER" #842K VICTORIAN BUILDING KIT-NEW IN SEALED BOX! 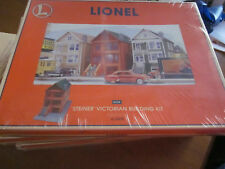 LIONEL STEINER 842K VICTORIAN BUILDING KIT 6-12975 - NEW STILL WRAPPED IN BOX. Lionelville 6-34109 Large Suburban House I produced in 2004. 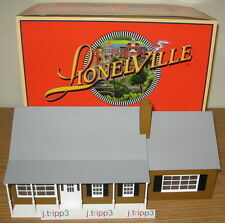 These new Lionelville Houses include interior lighting and modular construction for maximum flexibility on any layout. Gauge: Traditional O Gauge. Lionelville 6-34110 Estate House produced in 2004. These new Lionelville Houses include interior lighting and modular construction for maximum flexibility on any layout. Gauge: Traditional O Gauge. Most issues can be rectified through a conversation. LIONEL #6-12977 "KINDLER" #844K VICTORIAN BUILDING KIT-NEW IN SEALED BOX! 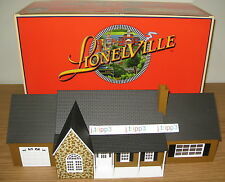 LIONEL #6-12977 'KINDLER" VICTORIAN BUILDING KIT! THE KIT IS NEW AND STILL SEALED IN THE ORIGINAL LIONEL BOX! THIS SOUGHT AFTER KIT IS OF EXCELLENT QUALITY & MADE IN DENMARK! AN EXCELLENT KIT THAT WOULD MAKE A GREAT ADDITION TO YOUR LAYOUT! Most Recent Catalog: 2018 C1 Big Book. Interior illumination. COLOR OF DELUXE BUNGALOW HOUSE IS GRAY AND GRAY BRICK. Most Recent Catalog: 2017 Ready-to-Run Catalog. Lighted interior. Legend has it that Charles is being walked to sleep by his pacing mother in the second floor nursery, and his brother Sean is being rocked by his grandmother on the front porch. LIONEL TRAINS. Lionel 6-85410. Interior illumination. Lionelville 6-34113 Large Suburban House II produced in 2004. These new Lionelville Houses include interior lighting and modular construction for maximum flexibility on any layout. Gauge: Traditional O Gauge. 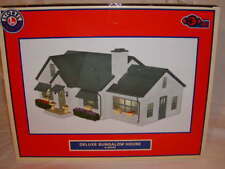 Lionel Suburban House # 6-82009. We DO make sure EVERYONE is SATISFIED. COLOR OF BUNGALOW IS PURPLE/PINK, BROWN AND WHITE. Approximate manufacture date is 2014 - MOST RECENT CATALOG 2016 SIGNATURE EDITION CATALOG. These new Lionelville Plug-n-Play Houses include interior lighting and modular construction for maximum flexibility on any layout. It was opened just to make a pictures. INCLUDED IN BOX IS THE "LIONEL WORK HOUSE OWNER'S MANUAL - WARRANTY/LIONEL SERVICE INFORMATION and extra wire and light bulb. Illuminated interior and exterior. This sturdy square building is the perfect place for workers to gather and discuss new projects on the horizon. Most Recent Catalog: 2017 Ready-to-Run Catalog. Lighted interior. COLOR OF LARGE SUBURBAN HOUSE IS BROWN. COLOR OF BUNGALOW IS YELLOW, BROWN AND WHITE. These new Lionelville Plug-n-Play Houses include interior lighting and modular construction for maximum flexibility on any layout. Interior illumination. 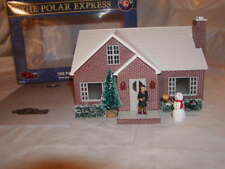 Expand your Christmas layout with our Deluxe Christmas House! Lionelville School KIT. School is back in session! LIONEL: 6-83658. Work with Lionel, Kline, MTH, Weaver, MDK, or any O/O27 trains! Gauge: O -027 Gauge. New in the Lionel Box! Value Added Lionel Dealer. Illuminated Barrel Shed NEW IN BOX! LIONEL: 6-81626. Will work your Lionel, Kline, MTH, Weaver, MDK, or any O/O27 trains! Gauge: O -027 Gauge. Lionel 2015 Ready-to-Run Catalog. Value Added Lionel Dealer. 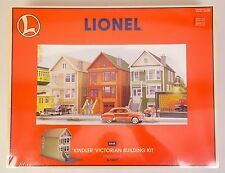 LIONEL KINDLER 844K VICTORIAN BUILDING KIT 6-12977 - NEW STILL WRAPPED IN BOX.